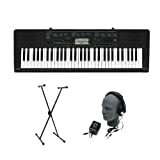 Casio CTK-2300 61-Key Premium Portable Keyboard Package with Headphones, Stand and Power Supply (UPC 874171004286) is sold at the following online stores. We've find the latest prices so you can compare prices and save money when making your purchases online. Please click on the links below to browse to each store's webpage.